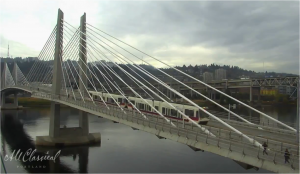 All Classical Portland is proud to announce the launch of the only live streaming, 24/7, real-time video of Tilikum Crossing: the All Classical Portland Tili-Cam! The Tili-Cam is located on the roof of the Hampton Opera Center and features a stellar, unobstructed and close-up view of Tilikum Crossing from the east bank of the Willamette River. Producing a high definition color image even at night, the Tili-Cam features automatic iris adjustment. To preserve and present the highest quality live motion image to the viewer, All Classical Portland streams exact images without format conversions. Made for extreme climates, the Tili-Cam is a heavy duty, waterproof and ruggedized camera with a windshield wiper. As an added bonus, the Tili-Cam includes an optional high-fidelity audio stream of All Classical Portland’s broadcast program. In addition to the other complimentary services All Classical Portland provides the community, the station is happy to offer this video, free of charge, at all times on its website. It is an ideal platform, open to all, from which to view weather, live events, happenings on the bridge or river, and the beautiful nighttime light installation on the bridge that reflects the Willamette River’s temperature, speed, and height. All Classical Portland is especially excited to offer this service as a resource to other media outlets. To access the All Classical Portland Tili-Cam, simply visit www.tilicam.org. Tilikum Crossing, Bridge of the People, is the only bridge of its kind in the U.S. carrying MAX light rail and Portland Streetcar trains, buses, bicyclists, pedestrians, but no private vehicles. It’s the first new bridge over the Willamette River in the Portland area in more than 40 years. Tilikum Crossing is part of the MAX Orange Line that opened in Sept. 2015. The bridge’s wide multi-use paths are part of more than $65 million in active transportation infrastructure invested along the Orange Line corridor.